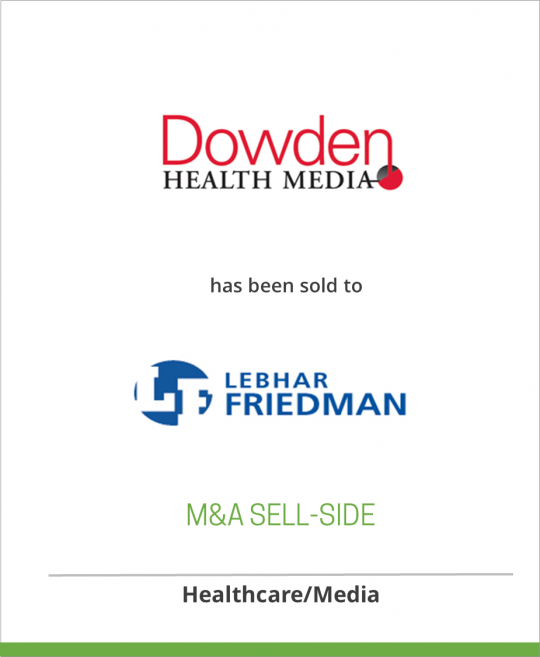 Dowden Health Media has been sold to Lebhar-Friedman, Inc.
Dowden Health Media, located in Montvale, NJ, and Northbrook, IL, is one of the few health media companies that specialize in healthcare communications to both consumers and physicians. This dual specialization gives Dowden a complete perspective on the real world of clinical care, bringing added value to its audiences and its clients. Dowden’s peer-review titles include: Contemporary Surgery for general surgeons; Current Psychiatry for psychiatric specialists; The Journal of Family Practice for family physicians; Mayo Clinic Proceedings for internal medicine specialists; and OBG Management for Ob/Gyns. Dowden also publishes the recently launched interior design publication New York Spaces, which reaches more than 325,000 households bimonthly. Lebhar-Friedman, Inc. is the leading independent publisher and provider of information serving the retail and food service communities and their vast supplier network. Owned by the family that founded it 80 years ago, Lebhar-Friedman’s diverse interests include Nation’s Restaurant News, Drug Store News, Chain Store Age, and event and association management activities. Lebhar-Friedman’s principal office is in New York with other facilities in Tampa, FL and Louisville, KY, as well as business interests in Japan and Spain.